Sweet Potato Gnocchi homemade from scratch tossed in a fragrant Garlic Sage Olive Oil. You will never want to eat store bought gnocchi again! 1. Use a small food processor or personal blender to blend together the mashed sweet potato, egg, and salt until no lumps remain. Place in a large bowl and add 2 cups of flour. Mix dough together until a sticky consistency, then knead the dough until smooth, adding additional flour as necessary so that the dough is no longer sticky. The amount of flour will depend on the humidity of the day and the size of your egg. I used 2 and 1/4 cups flour on a hot and humid summer day with a medium sized egg. 2. Bring a large pot of salted water to a boil while you work on step 3. 3. Cut the dough into 8 even pieces. Cover the dough with a damp towel and work with one piece at a time. Roll out the dough into a long rope until it is about 1/2 inch thick. Cut the dough into 3/4 - 1 inch pieces and use a fork to press the gnocchi down and form the beautiful gnocchi indents. Repeat with the other pieces of dough. 4. Add the gnocchi to the large pot of boiling water and cook for 2-3 minutes until the gnocchi are floating. Drain and rinse with cool water. 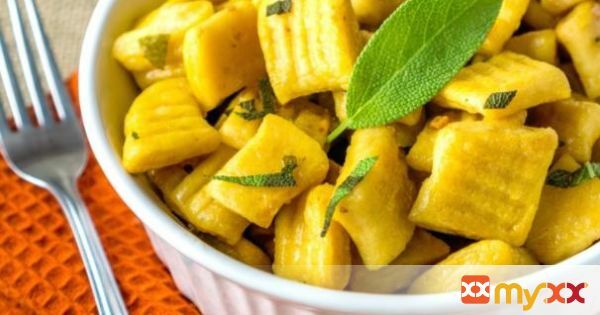 At this point the gnocchi are ready to eat - toss with your favorite sauce or use the delicious Garlic Sage Olive Oil recipe below. 5. In a large skillet, heat 1 tablespoon olive oil on medium heat. Add the garlic and the gnocchi and saute for 5-8 minutes, or until the gnocchi starts to turn golden brown. Add the 2 tablespoons of dry white wine to deglaze the pan and continue stirring. Add the chopped sage leaves and stir fry for another minute. Season with salt and pepper, if desired. Serve warm.